Now with 3 Models! 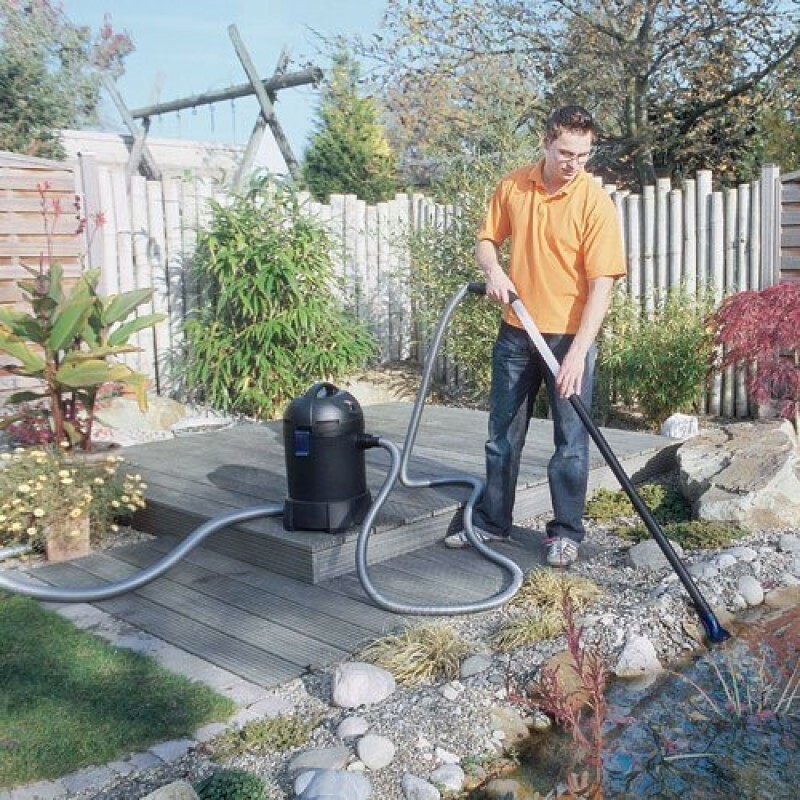 A pond vacuum can make cleaning muck and sludge from pond walls and rocks an easy job. 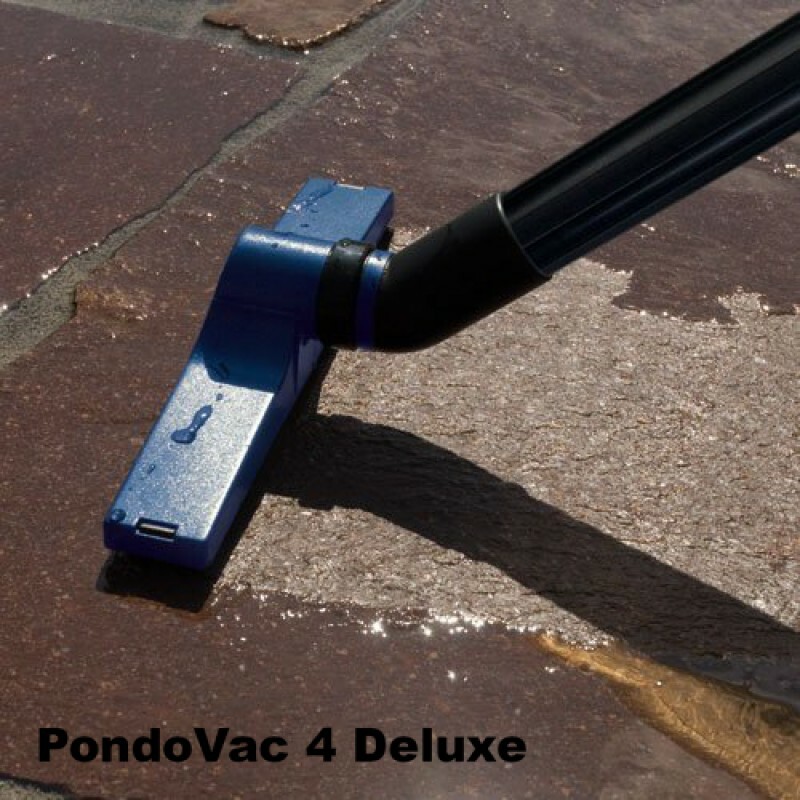 Two of the original models of PondoVac are available, the Classic PondoVac and the the best selling deluxe PondoVac 4. Both pond vacuums complete with various cleaning accesories. See below for details on the two models. 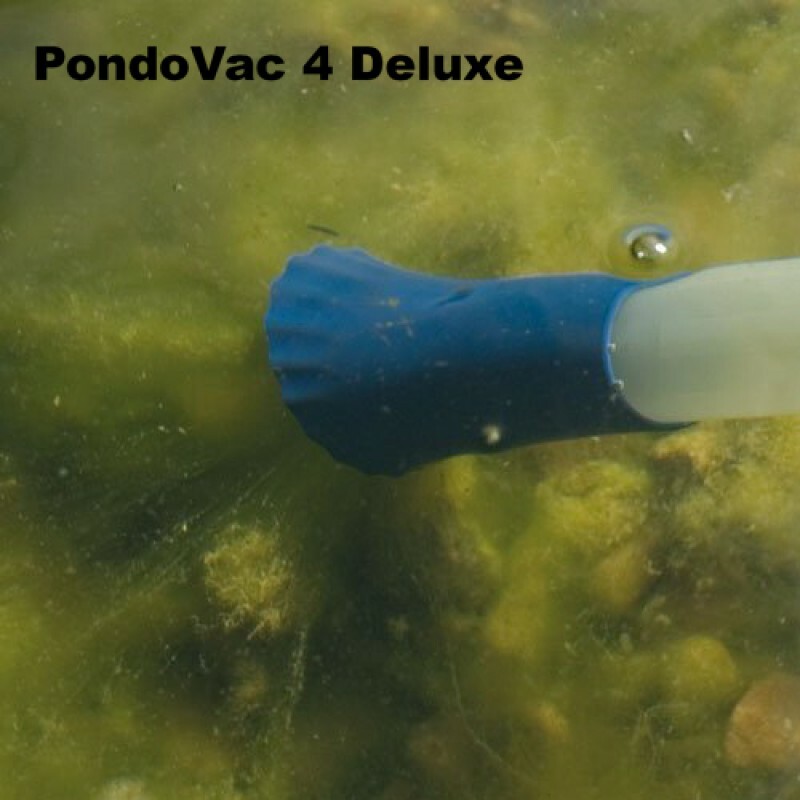 The PondoVac 5 was introuduced in Canada in 2017 and really takes the Pond Vacuum up to a whole new level! See details below on the three models. Many pond maintenance needs can be addressed by removing sludge and debris build-up around the pond. 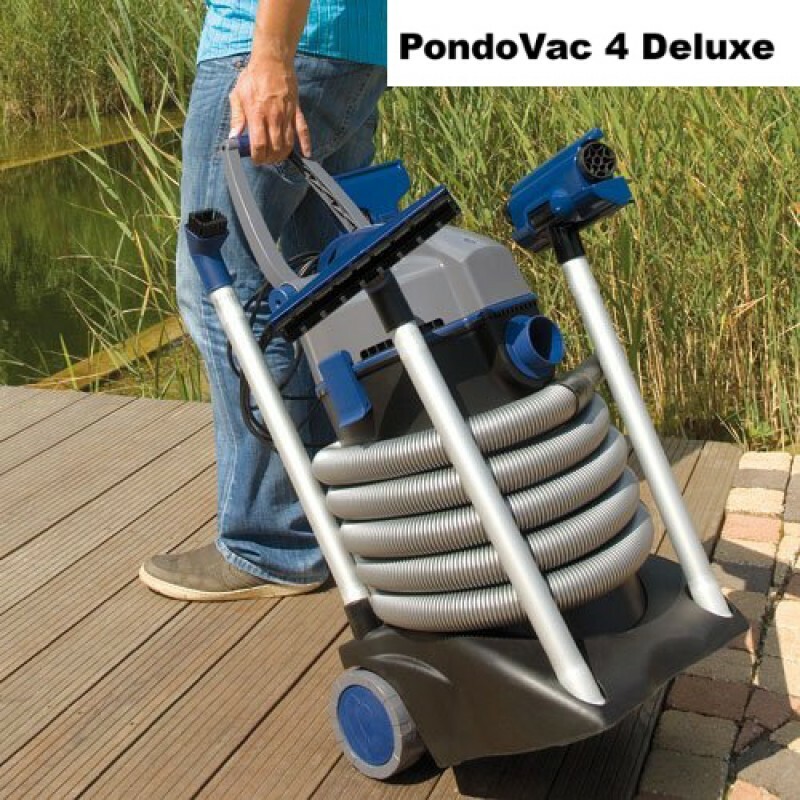 With the PondoVac pond cleaner this can be done in minutes, instead draining and refilling the pond over hours or days. 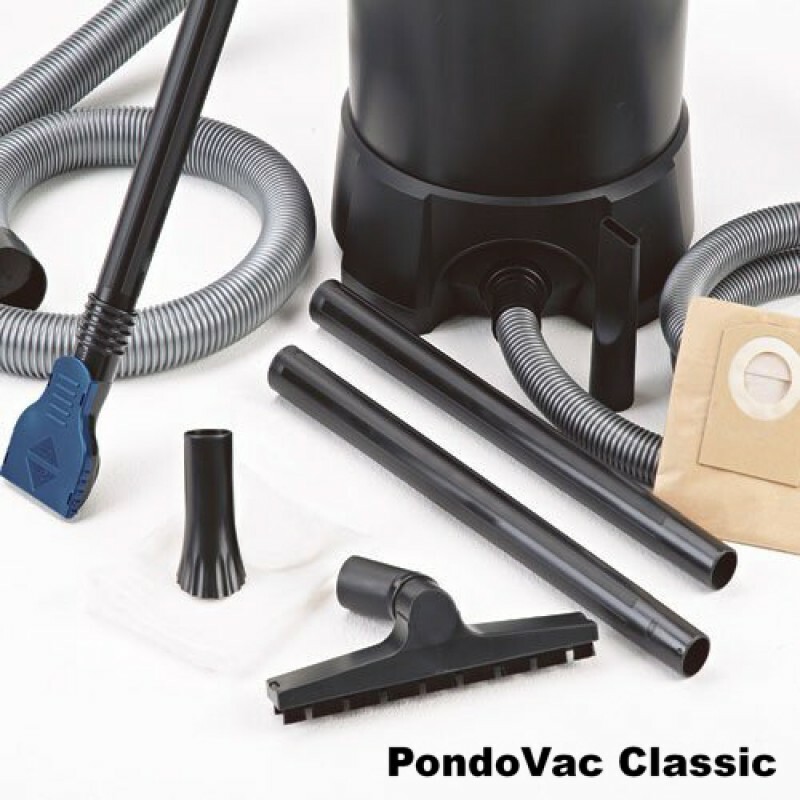 The PondoVac Classic's uses a single-chamber suction system that automatically alternates between suction and draining. The cleaning suction continuous until the tank is full at which point the motor stops and the reservoir drains. With its powerful 1200W motor, assorted nozzle attachments and many accessories, PondoVac Classic not only excels at pond cleaning but can also be used as wet or shop vacuum around the house. 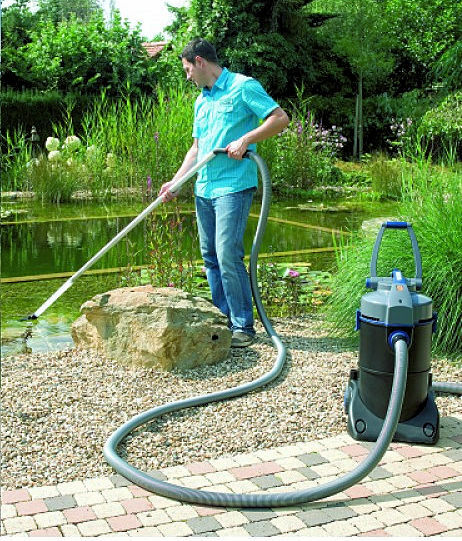 The best-selling, patented pond vacuum that doesn't take a break! Many pond maintenance needs can be addressed by removing sludge and debris build-up around the pond. 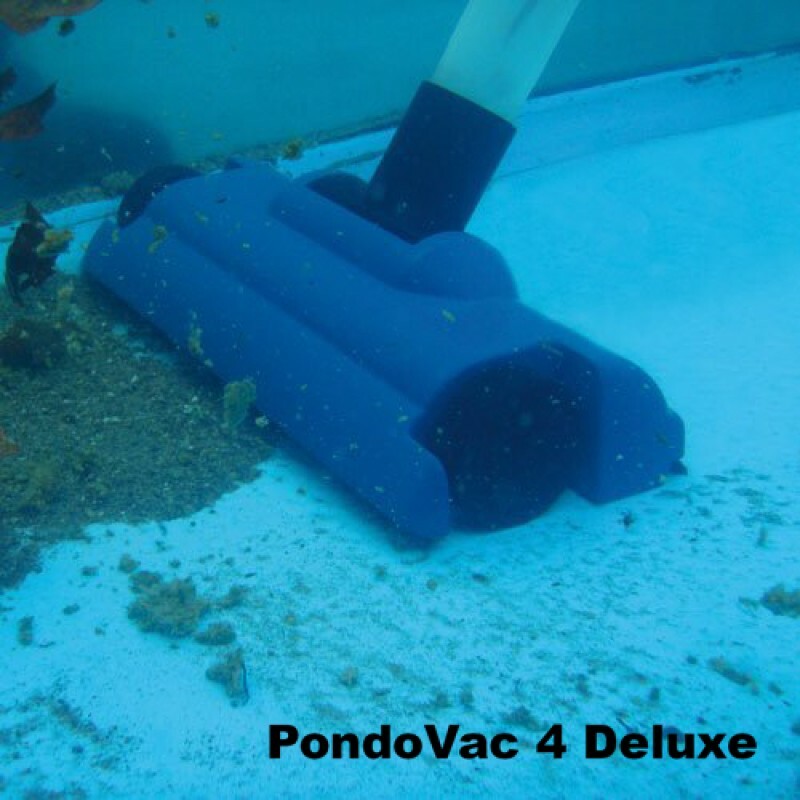 The Pondovac 4's dual-chamber suction system provides continuous suction and makes the necessary, but bothersome task of cleaning the pond from sludge, fish waste, decaying vegetation and other floor sediment easy and quick. 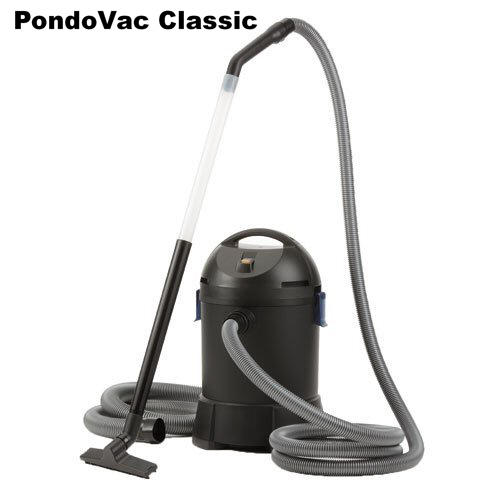 With its powerful 1700W motor, assorted nozzle attachments and many accessories, PondoVac not only excels at pond cleaning but can also be used as wet vacuum around the house and for cleaning swimming pools. 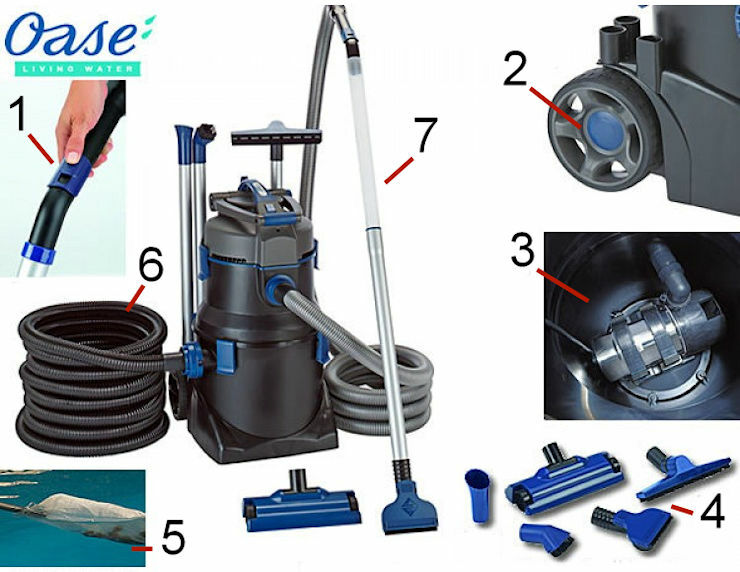 Oase was the pioneer of the original PondoVac Classic and dedicated themselves to improving their pond vacuum with the introuduction of the Deluxe Pondovac 4 and now OASE has introduced the Pondovac 5 to bring even more improvements and power for pond and pool cleaning jobs. 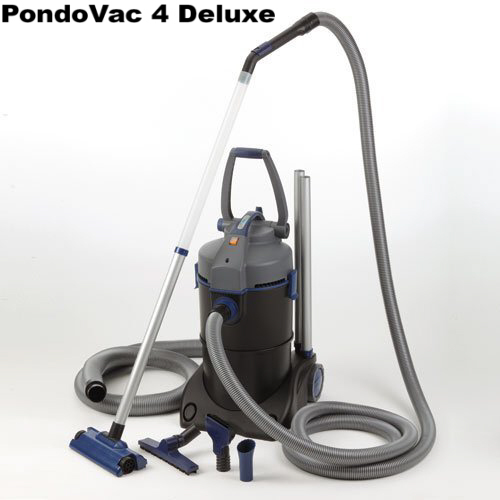 The Pondovac 5 has a capcity up to 40% more than the Pondovac 4 model. PondoVac 5 is more powerful yet uses the same 1700 watts of ower as the Pondovac 4. The high-performance PondoVac 5 pond vacuum works better by utilizing a combination of suction turbine with a feed pump which means more power to pump solids up to 1.5 cm ( 0.6 imches) over higher height differentials that the extra pump and turbine provide. No longer are you restricted by variants in terrain elevation as with previous models that required dishcharge hoses to be placed on a downhill slope. Suction pumping in the Pondovac 5 is a whopping 2115 gallons per hour (8,000 liters per hour) making it the perfect tool for larger ponds and water features and for commercial users and contractors who need to get in and clean the pond fast and efficiently. The best-selling, patented pond vacuum that doesn't take a break is now even better! Pond maintenance needs can be addressed by removing sludge and debris build-up around the pond, waterfalls, filters, streambeds and pond decking. 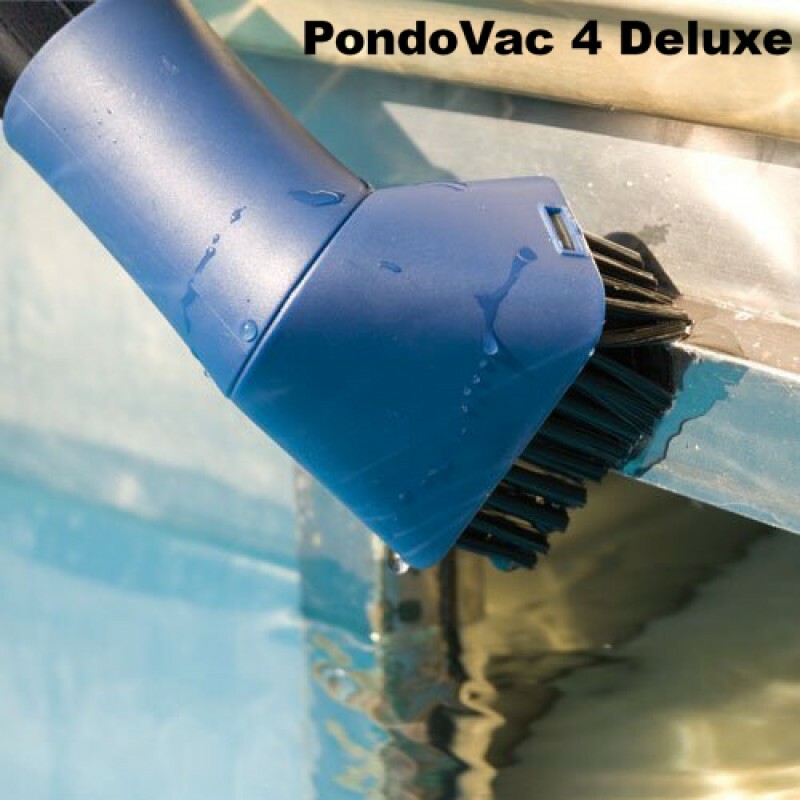 The Pondovac 5's expanded dual-chamber suction system provides continuous suction and makes the necessary, but bothersome task of cleaning the pond from sludge, fish waste, decaying vegetation and other floor sediment easy and quick, even quicker than the deuluxe PondoVac 4. Discharge Hose Length: 33 ft.
Power Cable Length: 24 ft.
For adjusting the suction power,which can be beneficial when cleaning shallow areas where too much suction could remove unwanted pebbles or decor. Special large wheels 6" (15 cm) ensure more stability and are more suited for rougher terrain. The extremely quiet wheels are specially designed for low-noise whilst in operation as rubber tire now covers the hub and spokes for a smoother ride. As the pond vacuum operates, larger particles such as pebbles, rocks, pine needles or leaves are retained in the holding bag. Emptying the unit is now easier because the debris is captured in the internal pre-filter bag. The bag closes around the pump with a zipper to hold in place. For retention of smaller particles less than 1 mm an additional fine filter bag is included for the outlet. It will capture any fine debris, exlcluding silt that is less than 1 mm in size, so if you are discharging the clean water back into the pond you are assured of clean, debris free water is being used. 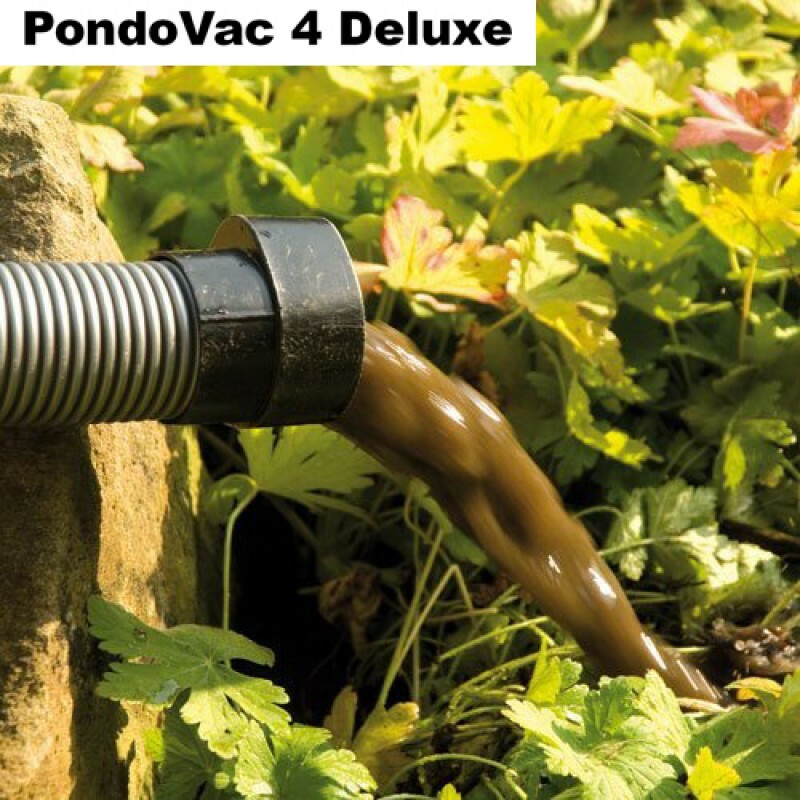 The PondoVac 5 comes with a selection of nozzles each designed for specific jobs that are the most common in pond and water feature maintenance. Specific algae, stone and smooth surface brushes are included so you'll be able to clean every situation properly. 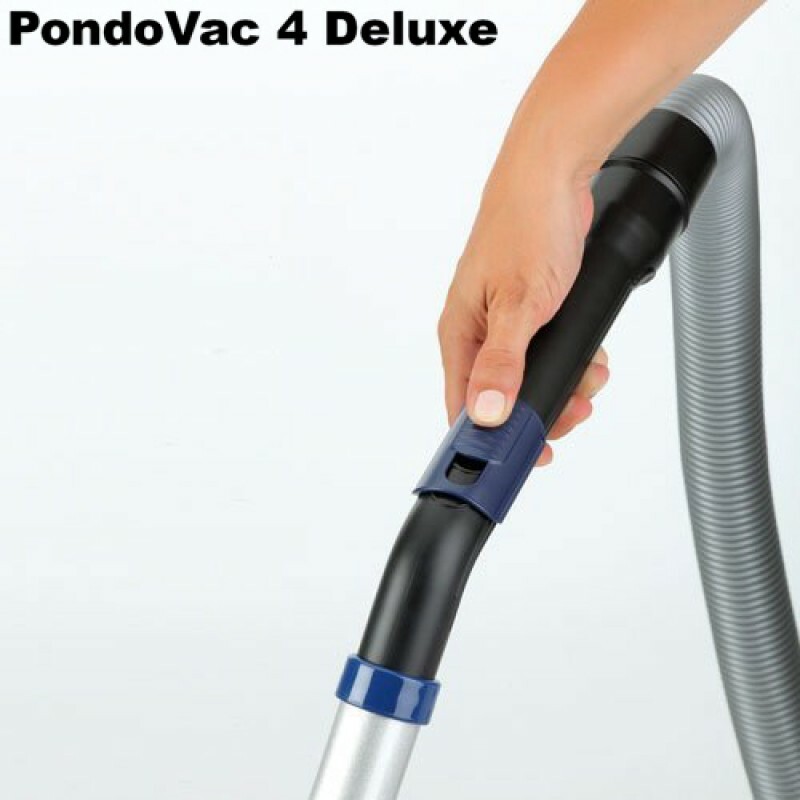 On the discharge side, the PondoVac 5 has a quick-connection for the hose for fast connections and a reliable seal every time. PondoVac 4 Video - The PondoVac 5 does more, even better!